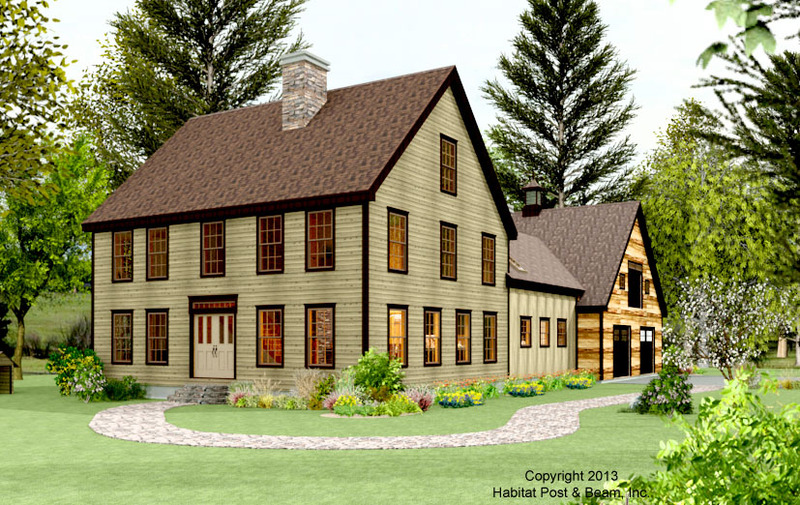 This is a traditional Colonial-style home with a rear ell connecting the main house with a two-car garage. The main level of approx. 1800 s.f. 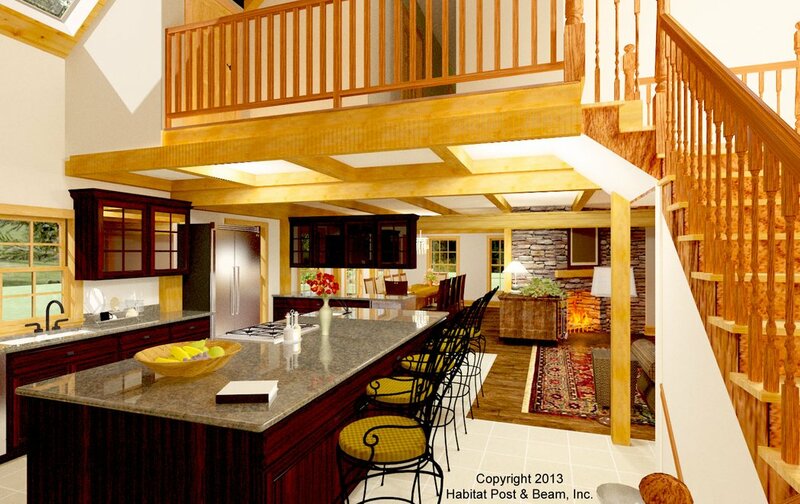 has a dining room, family room and office, and the connecting ell houses the kitchen, pantry, half-bath and sun room. The lower two-car garage level also has space for a home gym and storage. Upstairs is about 1200 s.f. 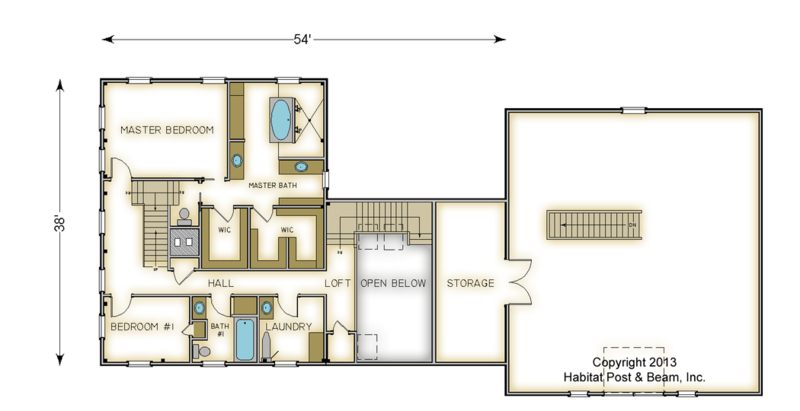 for the master bedroom suite, with walk-in closets and a laundry room. There is also a second bedroom with a private bath, and a loft looking down to the kitchen area below. The third floor attic space of about 740 s.f. is home to another bedroom and full bath, as well as another room that could be used as an office, library, TV room or an additional bedroom. For more information about our Colonial series, go to http://www.postandbeam.com/plan/129/ (Charleston Colonial), andhttp://www.postandbeam.com/plan/127/ (Williamsburg Colonial). Also see http://www.houzz.com/projects/50641/-3100, http://www.houzz.com/projects/51060/-2508, and http://www.houzz.com/projects/50860/-3094 for more photos. Package Price: $209,000 as specified below (from $186,500 to $236,000 depending on framing options). The standard price includes our Full Exposure Wall System, Plaster and Beam or Beamed Mid-Floor System (same package price), our Beamed Roof System over the kitchen and loft, and our Plaster and Accent Beam Roof System over the remainder. The entry porch is our Beamed Porch System, while the screen porch is our Liner Porch System with a flat ceiling. The garage is not included in the above pricing.